- Publisher Nearly 1,300 entries are included in this dictionary, ranging from grammatical terms to theological jargon. The resource is succinct and cross-referenced and covers the entire field of Old and New Testament studies. - Publisher This dictionary contains nearly thirteen hundred entries, covering the whole field of Old and New Testament studies. The entries range from technical grammatical terms to obscure theological jargon and are often terms that are difficult to find in other dictionaries. Wherever possible, cross reference, is made to related or equivalent terms. The majority of entries include a brief description of explanation of the term and an example from the Old and/or New Testament. Hebrew and Greek words are transliterated so that the dictionary can be used easily by students at any level, whether they have studied the languages or not. The New International Version is used for all biblical quotations. 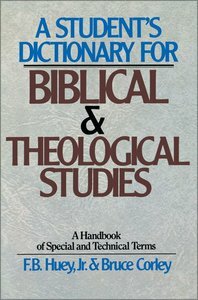 About "A Student's Dictionary For Biblical and Theological Studies"
Nearly 1,300 entries are included in this dictionary, ranging from grammatical terms to theological jargon. The resource is succinct and cross-referenced and covers the entire field of Old and New Testament studies. This dictionary contains nearly thirteen hundred entries, covering the whole field of Old and New Testament studies. The entries range from technical grammatical terms to obscure theological jargon and are often terms that are difficult to find in other dictionaries. Wherever possible, cross reference, is made to related or equivalent terms. The majority of entries include a brief description of explanation of the term and an example from the Old and/or New Testament. Hebrew and Greek words are transliterated so that the dictionary can be used easily by students at any level, whether they have studied the languages or not. The New International Version is used for all biblical quotations. Huey is Professor of Old Testament at Southwestern Baptist Theological Seminary, Fort Worth, Texas. Corley is Assistant Professor of New Testament at Southwestern Baptist Theological Seminary.